This came from Jennifer LaFleur of ProPublica on February 10, 2009: WikiLeaks Publishes CRS Reports; Gov’t Still Doesn’t. Reprinted here under creative commons license. In making many of its decisions, Congress relies on hundreds of analysts to study issues from stimulus spending  to alternative fuel vehicles  to human cloning . Many of those reports  have just been made available to the public via the pro-transparency site WikiLeaks , which has posted 6,780 CRS reports. The folks at WikiLeaks won’t say how they got the reports: “As for getting, everyone wants to know which member of Congress or their staff is our source. Naturally we can’t talk about that,” a WikiLeaks staffer told us in an e-mail. WikiLeaks says its collection does not include older reports that are available only on paper. Aftergood’s organization, FAS, has its own archive  of CRS reports dealing with national security, intelligence and foreign relations. Others have published the reports too: The University of North Texas Libraries has an extensive CRS collection  as does the Thurgood Marshall Law Library at the University of Maryland School of Law. And OpenCRS , a project of the Center for Democracy and Technology, has a directory to CRS collections around the country. One of the few natural outlets that doesn’t offer CRS reports: the U.S. government. Just in time for an early Valentine’s Day gift for nerdy wonks all around!! The State Department also has a collection of CRS reports and issue briefs available here. 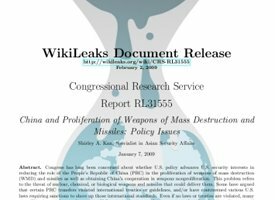 The CRS reports in WikiLeaks are available here.